The Department for Environment, Food and Rural Affairs (Defra) identified a gap in knowledge in terms of their extreme weather advice. There were no specific Defra publications for extreme weather, tailored for people who suffer with mental ill health, drug dependence or alcohol dependence – all of whom are identified as vulnerable groups to climate change impacts. Defra funded a 6 month research and development process to produce 6 extreme weather guides for extreme cold and hot weather. Equinox service users with a range of mental and physical health needs were to be involved in the process from start to finish. My brief was to manage the process in terms of gathering ideas, design and produce the finished suite of leaflets, then publicise. Through a series of forums, Equinox service users discussed how extreme cold and hot weather affected them and what would be useful information to collect and present in the guides. Service users agreed they had all suffered consequences such as: isolating alone for days at a time; being caught without enough money to buy food or suitable clothing; slipping over on ice; drinking or taking more drugs to ‘cope’ with freezing weather; staying out too long in hot sunshine and suffering headaches or disorientation; feeling too cold to get out of bed; missing vital medication or appointments, and in extreme cases, becoming very distressed to the point they needed urgent medical help. Extreme weather was a very real problem, people discovered, in their current lives. Together, we brainstormed a set of practical tips that could help other people in extreme hot and cold weather. Soon, there were lots of good ideas that people suggested from their own experience, about how people could take care of themselves. Topics proposed for the guides were: health; food and drink; money; clothing; keeping warm or cool indoors; essential tips for homeless people; keeping informed and in touch. The team sought expert guidance on health matters from medical professionals for accuracy. A key learning was that 1-2-1 sessions for service users with complex mental health needs were much more productive than forums. They allowed those service users to talk freely about how extreme weather had affected their lives, where they proposed some creative, simple and affordable ideas. 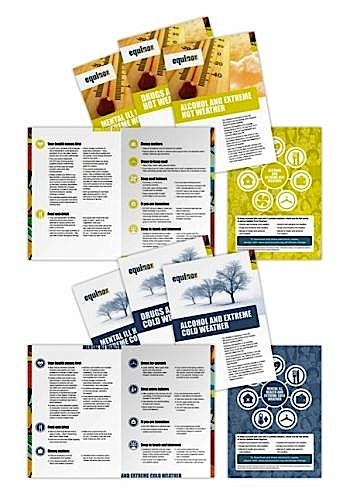 I also managed the distribution process for leaflet packs to be sent to relevant agencies in London and the South East.